Needed: Blender Course (DVD, Blender Cloud) Track, Match, Blend! Michael P. (forest-house) renamed this task from Motion Tracking: pre Blender 2.8 file prefetch freezes Blender to Motion Tracking: pre Blender 2.8 file prefetch footage freezes Blender. How long is the GUI unresponsive? How long is the prefetching taking for you? But I testet this with a png image sequence and the prefetch works. It seems that it doesn't work with video files. It freezes as described. But when I play the clip with "play animation" button it prefetches while playing. Prefetching image sequence is fast, responsive, and such. Prefetching movie files is slow, freezes interface and such ? That's weird and definitely something to look into. @Michael P. (forest-house), in 2.8 we've increased default value of movie cache size, to be more helpful for more real-world scenarios. So maybe you'd want to set it to a lower value. I tested this with an png sequence and I got the same behaviour as above. problems and I get 24 fps all the time. BTW. 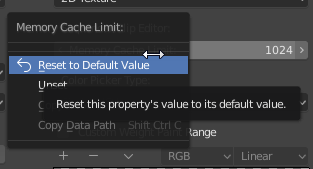 I wanted to reset the cache size in the preferences, but it resets to 0 and not to 4096.